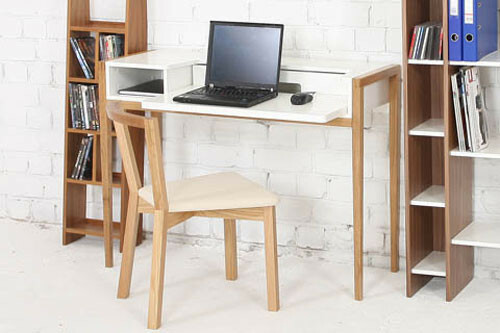 European manufacturer Woodman has been producing quality contemporary furniture for the home for a decade now. 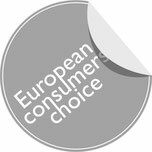 Focused on supplying domestic furniture to retail markets across Europe and North America, Woodman collaborate with a network of designers internationally, continuously innovating to develop new products for their retail partners. Democratising the work-from-home concept, the genius of the Farringdon Laptop Desk is its proportion. 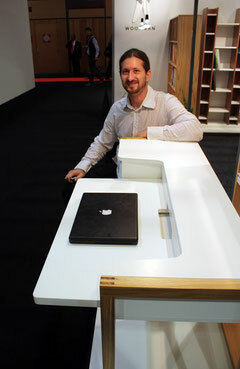 Conceived for apartments and small spaces the desk can sit easily in a hallway or lounge where space is limited, and is ideal for inner-city urban living. 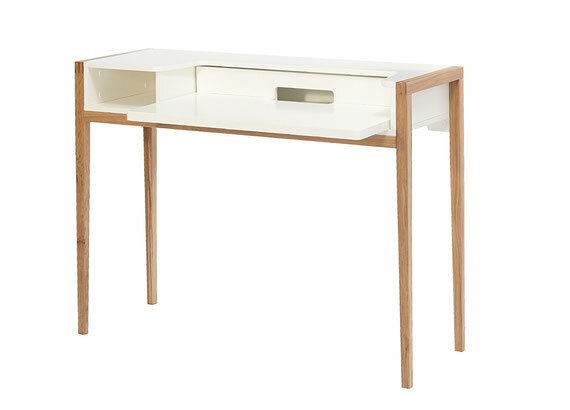 With a sleek design and minimal footprint, the curving desktop floats lightly on solid Oak legs with an open shelf for papers. 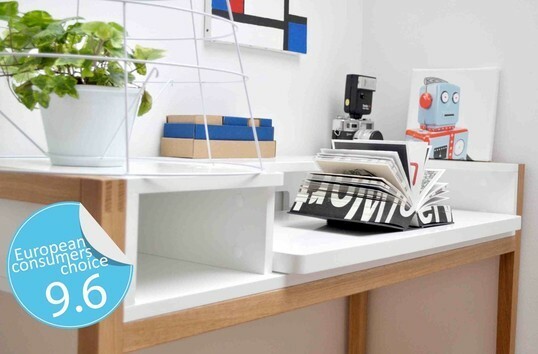 The sliding worktop extends to increase the work area and integrates cable management for a laptop or flat screen monitor, external hard drives and phone chargers. 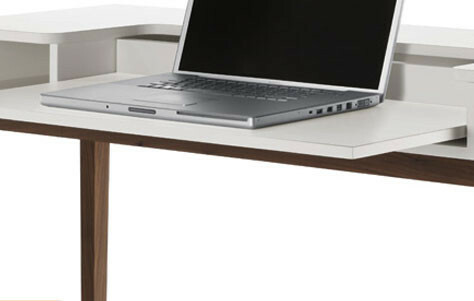 The Farringdon Desk innovates by incorporating the functional aspects of a larger desk into a compact form, while maintaining simplicity and elegance. This makes the desk ideal for domestic markets, yet extends the market as it is available to apartment and inner-city residents. The proportions of the desk are similar to that of a console table, which allows it to sit comfortably within a living area. To meet functional requirements the worktop slides to extend the work area. In addition cable management is considered. 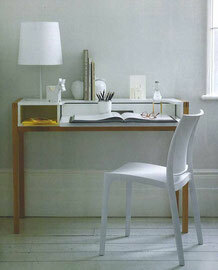 Superfluous elements such as drawers are removed, creating a minimal form. All solid timber and panel components of the desk are certified FSC and are sourced from sustainably managed forestry resources. The worktop is finished in white lacquer and the legs are solid American white Oak, with a finger joint detail. Pfeifer has a passion for contemporary furniture. The son of an antique restorer, Pfeifer's was a childhood immersed in traditional European and Colonial furniture. With engineers and carpenters on both sides of the family he was instinctively drawn to design, which he studied in Brisbane, Australia. Moving to London, he established his practice in 2003. From his studio in East London Pfeifer develops furniture and home accessories for design-led retail and contract markets. Pfeifer’s style has been strongly influenced by the Modernist Movement. His designs follow pure and geometric form to produce minimal compositions with fine detail intrinsic to the work. Having worked across a range of design industries including consultancy, R & D and manufacturing, Pfeifer has a wide scope of experience and a pragmatic approach to furniture design. Pfeifer believes that our values are reflected in the decisions we make, so it follows that the furniture we choose to live with, in part, defines us. As such, furniture and our belongings create a framework of values and choices that identify who we are. Pfeifer’s work is motivated by the understanding that the challenge is to develop appropriate solutions relevant to people, but where the function, form, materials and manufacturing come together – elegantly. The goal is to create honest designs, with simple function and a clean style. Inherent elegance is always a requirement, with the intent to define novel ideas, leading to innovative solutions. Leonhard Pfeifer is committed to the notion of sustainability through quality. Furniture can last a lifetime, or many lifetimes. Quality is the key – quality in design, quality in manufacture, quality in materials, and quality in care. Furthermore, the aim where possible, is to use natural materials and processes to his create furniture. Working with manufacturers, Pfeifer investigates alternative materials and manufacturing processes that may lead to better ecological outcomes. "In fact, this company has got it : we all change to flat screens and portable pcs so why persist in making desks which look like dining tables ? 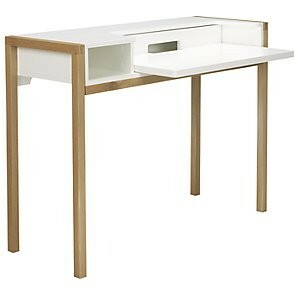 This desk has sobriety, is natural and welcoming. 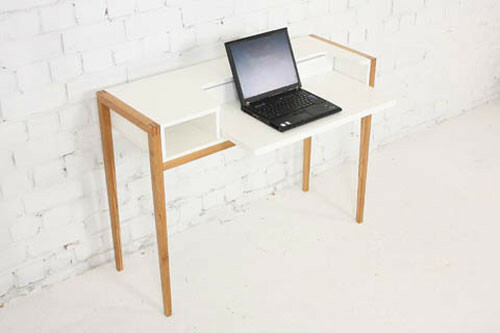 A very functional small workstation which fits in any room in the house"
"It only takes five minutes to assemble it for a perfect result. It is well thought- out design at a very low cost for this level of quality." "The Farrindon Laptop Desk is one of those sleek products which will pass the test of time and probably become the iconic occasional desk"